Pot of chowder. Photo by Nancy Long. This thin broth chowder is simple and delicious. 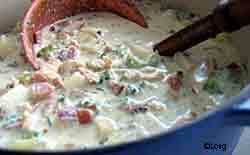 I have never found a chowder I like better than Grandma's. If you like thick, gloppy chowders or don't want a robust clam flavor, this recipe is not for you. Add 1 pint of clams chopped into 1/4" pieces (easiest to chop while still slightly frozen) Use cleaned clams, clams with the stomach removed and the black tip of the siphon cut off. cook until clams are cooked through but not tough. Garnish with 3 or 4 tbsp of chopped fresh parsley. Receive a monthly notice about new issues and articles.